In February 2018, researchers detected a few ransomware threat aimed at Japanese-speaking PC users. One of the threats is the Driedsister ransomware, which encrypts files but does not require ransom money. Malware researchers are wondering whether the release of this threat is the schemers' joke, or it is just the beginning of something that is going to cause more havoc around the globe. In any case, it is crucial to remove the Driedsister ransomware once it is spotted on the computer. 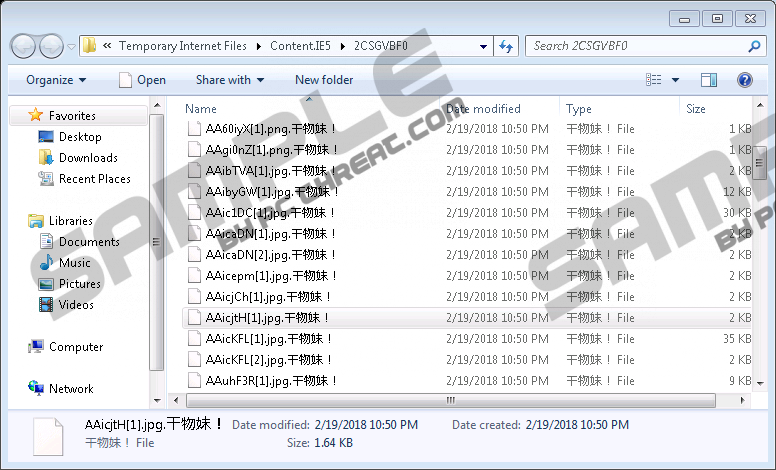 First and foremost, the Driedsister ransomware tampers with the most frequently used file formats. That means that various documents, photos, audio and video files, archives, etc., are encrypted so that the victim cannot use the files as usual. Every name of the affected file is altered by adding the extension .干物妹, which translates as Dried Sister, hence the name of the threat. The Driedsister ransomware does not create any file demanding a ransom, but only shows a program window with an female Anime character. The same behavior was observed in an earlier detected ransomware dubbed Umaru. Some malware researcher may use the name Umaru to refer to the Driedsister threat. It is not known how many computer users are affected by the Driedsister ransomware. And it is difficult to speculate whether any changes in the code of the threat will be made to upgrade the infection into a money-demanding infection. A typical ransomware infection displays a ransom warning in a pop-up program window and also creates notepad files containing the same or different information regarding money submission. Victims are usually asked to spend $50-$300 in Bitcoin, but the sum may be even higher in some ransom notes. The Bitcoin currency is a crypto currency allowing senders to make anonymous money transactions, which are made to non-personally identifiable accounts. Schemers earning money with the help of ransomware have raised substantial revenues just because their victims have mistakenly believed that by paying up they will regain their damaged files. Law enforcement institutions advise people against paying up for a very simple reason. Paying the ransomware does not guarantee a fix. Instead, computer users should take measures to prevent ransomware attack. To do, it is important to back up files to an off-line device, update the OS and software whenever new updates are release, and, without a doubt, prioritize online security. A lot of people fail to prevent malware just because of the belief that their devices are going to remain unaffected. It has not been determined yet how the Driedsister ransomware spread; nevertheless, it is essential to be aware of different ways of malware distribution. For example, spam emails and spear phishing emails that are supposedly sent by a famous company are very often used to spread malware. Instead of downloading a questionable attachment or clicking on a link asking to verify your account for no reason, remove that email. Drive-by downloads are also used to spread malware. Such downloads usually take place on a website of poor reputation. For example, dating websites, freeware sharing websites, and online gaming websites are very often full of third-party advertisement. A careless click may catalyze a lot of unwanted changes. A malicious program may be downloaded to the computer to make unauthorized changes, which can be prevented by keeping the operating system protected. The RDP service is another method for spreading malware. The service is now widely used by business to have their IT issues solved remotely by outsourced service providers, thereby enabling third parties to control a computer or the whole network. Cyber attackers take advantage of poor RDP credentials by carrying out brute-force RDP attacks to inject malware. Therefore, to minimize the risk of falling victim to ransomware, strong login data should be used. Now you should remove the Driedsister ransomware from the computer and take all the measure necessary to keep different online threats at bay. You can remove the executable of the Driedsister threat manually, but it can also be done for you by a professional malware prevention tool, which will analyze the system for you and terminate harmful files and process. Remove questionable recently downloaded files located on the desktop. If no suspicious-looking files are present on the desktop, check the Downloads and Temp folders. Quick & tested solution for Driedsister Ransomware removal.